It seems so much is written about the Russian language. Maybe I see it that way because I am interested in it, but to me it seems to always be there, and everywhere. I’m hopeless at it though. Facebook recently advertised that on the Asia Pacific edition of Russia Beyond the Headlines there a test for those learning or wanting to speak Russian. It allows you to use an online translator too. The link is here if you want to try it. When I tried, I didn’t do too badly, even though I am embarrassed to say I did use an online helper. I get text messages from my Russian colleagues all the time, often in the Russian language or with Russian phrases in them. Occasionally I understand, but that’s very occasionally. Most of the time I’m stuck, and annoyed. I wonder at experts like Alexey Mikheev. I read his work and am astounded and fascinated. He’s so knowledgeable and very readable too. How can someone be so accomplished in English and in Russian? п is pi, and that’s ‘P’. ф is phi, and we can say ‘F’. What also helps me is the logic that each character is pronounced the same way all the time. с is always pronounced ‘S’. Always and always. What a bonus that is, and it makes me realise how hard it is for those who have to learn English. We use a ‘C’ in ‘cat’ and we use the same letter ‘C’ in ‘city’, but we don’t say them the same at all. Like so many people, blessed with just a little bit of knowledge I have really strong opinions! These are based on just my empirical observations. It seems to me (remember it’s just an opinion) that a great deal of the Russian language consists of English words. I’m guessing it’s about 20%. There are lots of times I see a written word and then struggle to say it. When, or if, I can say it I say it over a few times and sometimes its meaning dawns. I know this word! and I know it because it’s an English word. 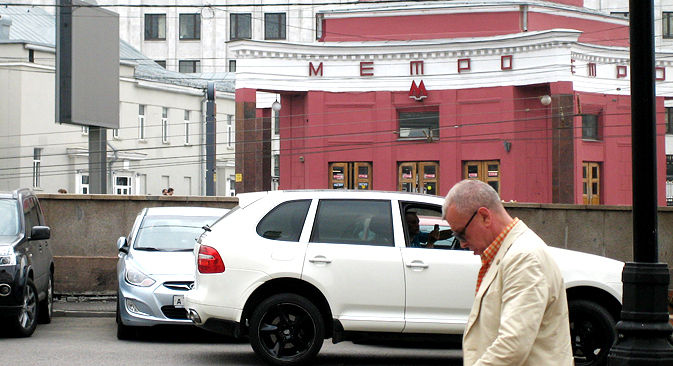 I remember seeing a sign in Vladivostok, down by the railway station and across the road. It read супермаркет. I struggled for a while, saying aloud: ‘SSS oo per mar ket’. Oh! It’s ‘Supermarket’. I can understand when you see it for the first time, but when you see it a hundred times surely you must start to wonder, and make some guesses. C is pronounced ‘S’ (always remember), T is ‘T’, O is ‘O’ and п is Pi: our ‘P’. So the word is ‘STOP’. I have a sister in law. She travels a lot and has been to Moscow, but almost always goes on a guided tour. There’s a possibility that she’s been cocooned there too. I was stunned and really happy to hear that she and her husband recently ventured alone into the Moscow metro, lured by tales of the cathedral-like paintings, the sculpture and the posters. I reckon others in the tour must have been stunned. Well, a metro is a metro is a метро. If you can find your way around the London one you can probably also figure out the one in Paris. The one in Moscow is the same of course, except that the station names are in Cyrillic. You go into the station off the street, up to a machine, poke 30 rubbles in, and out pops a ticket. You go to the board and note the place you want to go to, and you try to figure out the way the placename looks, and you count the stations in-between. I might want to get to Киевский because I can walk around from there and get a boat tour at the Radisson Hotel. I find the platform and hop on, knowing how many stops away it is. I count: one, two, three... I look out at the names on the stations. A local lady sees me counting and wondering. Then she says in perfect English: ‘Where do you want to go?’ ‘To Киевский’ I say, in what I think is my best Russian accent. ‘Ahh, two more stops’ she says. When Киевский rolls around she gesticulates ‘Here it is, it’s here!’ and I hop off. So far so good. If you look closely you’ll notice a word in that photo which is a good one to know and not too hard to recognise: ресторан. With a little deduction you can almost read it. н in Russian is our ‘N’. and even in my morning haze, and at this distance, I can see they sell coffee. and, as I’ve already mentioned ф is ‘F’, so кофе is coffee, of course! The idea is to get out and walk, and to visit a restaurant or a bar, and shop and see the sights and travel the way the locals do. To buy flowers, drink the coffee, eat at cafes. This way you engage and speak and communicate. If you are fair dinkum and sensible you will meet fair dinkum and sensible locals. They are interested in helping you and being with you and sharing your enjoyment while you are helpful and enjoying life. If you are arrogant or stroppy, or haughty, then that’s the kind of local you will meet. And so it goes. The bus and the walks go on. Those cocooned in a bus seat can still look out of the windows and see the signs all over Russia. What do you see? What do you understand?